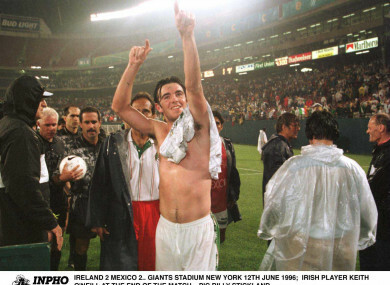 Ireland's Keith O'Neill celebrates after a US Cup match in 1996. AS MICK MCCARTHY prepares for the first match of his second spell as Ireland boss against Gibraltar this evening, it’s worth nothing that the situation bears some similarities to his first spell. Granted, there are differences too. McCarthy had far more Premier League stars to choose from then than he does now, while he had two world-class footballers coming into their prime in 1996 — Denis Irwin and Roy Keane. But much like the current era, the McCarthy of 23 years ago was faced with the arduous task of rebuilding an ageing squad that had served the previous management very well for a period. Nevertheless, a successful run petered out badly and there was a sense of staleness amid a pitiful anti-climax that saw Jack Charlton’s side outclassed by an exuberant Dutch outfit at Anfield in a winner-takes-all Euro ’96 play-off. And as is the case now, one of McCarthy’s biggest challenges back then was unearthing a top-class natural goalscorer. Of the four strikers picked in the manager’s first squad – Niall Quinn , John Aldridge, Tommy Coyne and Tony Cascarino — three were in their mid-30s and coming towards the end of their international careers. Quinn, who would be part of Ireland’s squad all the way up to the 2002 World Cup, was the exception, but it was obvious he needed help. Damien Duff and Robbie Keane were still two years away from making their senior debuts, and so there was a void to be filled in the forward department. Two raw youngsters emerged who appeared to have the potential to fulfil this responsibility: David Connolly and Keith O’Neill. O’Neill had made his Premier League debut for Norwich as an 18-year-old in November 1994 and caught the eye as a hugely promising left winger. McCarthy, however, perhaps partially on account of a dearth of alternative options in that department, chose to play him up front. The Barnsley native’s reign as Ireland boss began inauspiciously. The first three friendly matches were all losses, against Russia (2-0), Czech Republic (2-0) and Portugal (1-0). The lack of goals was a glaring issue. After being introduced off the bench late on for his debut in the Portuguese encounter, O’Neill was handed a start in a subsequent match against Croatia a few days later. An assured performance saw him score amid a 2-2 draw and his potential became increasingly evident during a superb run of four goals in five matches — including one in McCarthy’s first competitive match in charge, a 5-0 win away to a Liechtenstein side that held Charlton’s men to an infamous 0-0 draw just over a year previously. On account of this early form from O’Neill, Ireland fans would have been forgiven for prematurely believing the answer to their goalscoring woes had arrived. Yet despite this initial promise, O’Neill would win just seven more caps and not score again for his country. Nonetheless, the Tolka Rovers and Home Farm youth product still savours the memories of this era. “I was such a big [Ireland] fan,” he tells The42. “I used to mitch off school on a Wednesday to watch the games. “When I first got involved, my dad called me when I was training for Norwich City. He heard on the news that I’d been called up. While many were no longer in their footballing prime, a number of the heroes of the Charlton days were still around when O’Neill came onboard, and the Dubliner admits to initially being somewhat “in awe” of his surroundings. This dreamlike scenario got even better on a memorable June day in Lansdowne Road for O’Neill’s full debut, when he scored Ireland’s first goal of the McCarthy era. I remember Mark Kennedy crossing it in, Niall Quinn chesting it down on the edge of the box and I hit a half-volley. I can’t remember hitting it, I can only remember the back of the net shaking. It was the craziest feeling. The raw emotion that runs through your body. Two or three minutes after the match re-started, I was still thinking ‘oh my goodness, I’ve scored a goal for my country’. “With the belief [Mick] had in me, you’re playing for your country, you’ve scored a few goals, your confidence is high. The 1996 US Cup tour consolidated O’Neill and Ireland’s confidence. After a disappointing opening loss to the hosts, they earned a creditable 2-2 draw with a tough Mexico side and a 3-0 win over a Bolivian team that had played in the World Cup just two years previously. With other young players such as Shay Given, Ian Harte and Gary Breen gaining invaluable international experience during those months, it felt as if McCarthy was increasingly putting his own stamp on the team. There were darker days ahead though. Perhaps the most memorable game from this period was the disastrous 3-2 defeat away to Macedonia. That fixture served as a reminder to Ireland’s youngsters that they still had a long way to go in their attempts to emulate the glory days of the late ’80s and early ’90s. “I was on the bench, I was injured,” O’Neill recalls of that Macedonia trip. “I’d done my ankle ligaments, but I was keen to play the game. I probably would have started, but they decided just to put me on the bench — I wasn’t fit. I came on when we were in a bit of trouble. The game got a bit nasty. Jason McAteer [was sent off]. “I remember the orange jerseys, which I don’t think we ever wore again. Despite that setback, Ireland still did enough to get as far as the World Cup play-offs, before narrowly losing out to Belgium amid a 3-2 aggregate loss. But more bad fortune was to come in the following campaign for both O’Neill and the team. The Euro 2000 qualifiers featured some hugely encouraging moments, with home victories over Croatia and Yugoslavia, who had reached the 1998 World Cup semi-finals and round of 16 respectively. McCarthy’s side were seconds away from topping the group and qualifying automatically at the expense of their highly-rated rivals, but it was a familiar foe, Macedonia, who shattered this dream in the cruellest of circumstances. With the Boys in Green leading 1-0 deep into second-half stoppage time, they just needed to defend one more corner successfully to secure a place at the upcoming tournament in Belgium and the Netherlands. Unfortunately, Goran Stravrevski escaped the attentions of Tony Cascarino. O’Neill was supposed to be blocking the space he ran into, but slipped at the inopportune moment, and could only watch as his opponent’s bullet header found the back of the net. That one goal left the Irish team distraught. O’Neill was as heartbroken as anyone. But there was palpable tension in the dressing room afterwards. In an interview with The Sunday Times, three years after his retirement, he recalled how McCarthy blanked him after the match and the pair had not spoken since. The player was dropped from the subsequent squad for the play-off match against Turkey and O’Neill felt as if he was being made a scapegoat for the team’s shortcomings. “I’ve said my piece about this back in the past. I think everyone’s had an opinion on it. I felt at the time I was the fall guy for the whole thing. “After the game, it’s just raw disappointment. When I look back, it’s just sadness that we didn’t do it, because it was such a good performance that night and it was just one of them things. “We were very unlucky in the play-offs against Turkey and it just [exacerbates] the agony really, because the group of players definitely deserved to be part of that tournament. “I never once went out with the intention of letting my country down. Some things just happen and in the moment, things are said. “It was a long flight home and we had a long wait in the seats around Skopje Airport. “Everyone is thinking: ‘We should be celebrating here, but we’re in this position.’ But it’s stuff that makes you stronger. You look at [largely] the same group of players, what they did in 2002 [at the World Cup]. You need to shake yourself down and move on. This ill-fated fixture was the last time O’Neill represented Ireland. Although the pair got on well at first, with McCarthy giving the young player the chance to make his international debut, after Macedonia, their relationship appeared to disintegrate. The ill-feeling was heightened by comments McCarthy made in a book on Ireland’s 2002 World Cup. “Keith’s failure to make any further impact is down to Keith, not to anything that happened in Macedonia,” he said. Reading this comment, O’Neill felt he was getting unfairly blamed for regularly being injured — a sensitive issue and one that the player struggled with throughout his career, having suffered from degenerative bone conditions in his spine since childhood. Despite being out of favour, the accomplished attacker still had hopes of earning an Ireland recall. He continued to impress at club level. A series of noteworthy displays for Norwich saw him linked with clubs of the calibre of Leeds, Arsenal and Tottenham. Eventually, he joined Bryan Robson’s Middlesbrough aged 23 for £700,000 in March 1999, with stars such as Juninho, Christian Ziege and Paul Gascoigne among his team-mates there. O’Neill started well in his new surroundings, helping the club climb into the top six at one point, before another serious injury struck and curtailed his hopes of getting back into the Ireland squad in the lead up to the 2002 World Cup. “I was starting to do well for my club in 2001. Then I broke my tib fib and dislocated my ankle. I was out for about nine months. “There were opportunities for me to be called back up, but I pulled out of [so many] Irish squads through injury. It was quite unbelievable. Time supposedly heals all wounds, and so it proved with McCarthy and O’Neill. The pair ultimately made their peace, having gone several years without speaking to one another. I think it was a Bobby Robson Golf Classic event out in Portugal. I went up to him and said: ‘I’m sorry for everything that’s been said. I’ll always be indebted to the opportunity you gave me.’ The two of us made it up and we had a few pints. We chatted about it. I loved Mick and Mick loved and cared for me. It was just a nice moment that we could make it up after all those years, because he’s a man I respect greatly. Four years after his last international match, O’Neill hung up his boots at the age of just 27. Having left Boro for Coventry in 2001, an injury-ridden spell with the Sky Blues saw him make only 12 appearances over the course of two years. With the benefit of hindsight, O’Neill has some regrets about how he managed his body, in addition to feeling he would be better placed to cope with such injury problems in the modern-day Premier League environment. “Every case is different and ever player is different,” he says. “And nowadays, they treat it as so. For me particularly, because I had such issues with my back, if I didn’t release my pressure points around my glutes or transverses, it just didn’t allow me to run properly, I needed to be quite loose. It’s all changed now. When you play for your club, you get that specific treatment and they see your issues on a daily basis — in the early days, it’s probably fair to say that level of guidance was not there. I remember I was at Middlesbrough and there was a player there, Alen Boksic, if he had a cold, he wouldn’t play. We played Bradford away and he wouldn’t leave the dressing room — there was no hairdryer in the dressing room. He went berserk. The kitman had to wrap towels around his head to get him out onto the bus, because it was ingrained into him never to go outside with wet hair. If he wasn’t feeling absolutely 100%, if his body wasn’t 100%, he wouldn’t play. “When I was at Middlesbrough, I never played one reserve game. The minute I was fit, because we were in relegation battles and it was always a big game, I played. But because I never got any endurance in me, I’d only play three or four games, and then I’d be injured for three or four games. Statistics have starkly illustrated just how difficult it can be to adapt to life as a former Premier League footballer. And O’Neill admits it was far from plain sailing for him initially. “The first six months weren’t bad. You just go and do the things you’ve never been able to do, like go on holidays when a season’s going on. “Me and my now-wife went on loads of city breaks around Europe with pals. But then, after the fun wears off, in your head, you realise: ‘Where am I going to go now?’ Football was all I knew. “I made the decision that I was young enough and talented enough in other areas that I didn’t want football to define my life. I just had to go out and start at the bottom somewhere else and make a career for myself, which is a very difficult thing to do for your ego at the start. “It would have been quite easy to feel sorry for yourself and I know it sounds strange. [People might think:] ‘How can you feel sorry for yourself?’ But that is how you can feel at the time. I’m glad I made the effort and a lot of that’s to do with the foundation around you, and really good family and friends that support you, that’s something I had in abundance. Some players, past and present, don’t really have that foundation or opportunity. “I did a bit of media work, but I always had it in my head that there would be more famous people than me retiring ahead of me. I wanted a bit of security. When I was doing media work, it was all very sporadic. “The pool was getting smaller, so [I thought] ‘let’s do something different’. And that’s what I did. O’Neill is now based in Cornwall and has swapped football for a life in the business world, working for some of biggest food companies in Britain over the past number of years. “We don’t just work hard, but we have great banter, good camaraderie and we’re a good team. And that’s another thing that you could say is similar to your days as a footballer. It’s one of the things I used to like [about football]. I’m a Man United fan. A lot of my good friends are still involved with that football club, so I’d go and take clients up there. I love the rugby now, even though Ireland didn’t do great in the Six Nations. Consequently, in carving out a life for himself outside of sport, O’Neill has succeeded where many others have struggled, in the process showing the same skill and resilience that served him well as a footballer. “You need to believe in yourself,” he adds. “You need to surround yourself with the right people. Email “The fall and rise of a former Ireland and Premier League teenage sensation”. Feedback on “The fall and rise of a former Ireland and Premier League teenage sensation”.